Former IBF/WBA light welterweight champion Amir Khan says he still hasn’t given up hopes to land a big money fight against one of the huge stars Floyd Mayweather Jr and Manny Pacquiao in 2015. He’s still thinking that one or both of them may decide to face him this year so that he can prove to the world that he’s better than him. Khan says he’d like nothing more than to get a guy like former three division world champion Adrien Broner in the ring so that he could show his skills off against the American star. There’s probably little chance that Khan can get a fight against Broner even though both guys are managed by Al Haymon. The manager seems to be keeping both fighters in separate lanes at the moment as he slowly tries to build them up into stars by matching them against beatable opposition instead of the truly dangerous guys. I think it’s safe to say that the last thing that Haymon is going to do is match the slow as molasses Broner against a guy like Khan. It would be like making Broner walk the plank in the middle of the ocean. Khan may have a chin problem, but Broner looks like he’s barely hanging on at 140 at this point. He clearly is no better cut out for this division as he was for welterweight. Broner is just too slow, too lazy and too non-mobile to excel at 140. We saw that clearly with his poor performances against Carlos Molina and most recently Emmanuel Taylor. If Haymon hasn’t sat Broner down to give him the cold reality of him not being a good fit in the light welterweight division then he needs to do it before he suffers his first loss in this weight class, because it’s really only a matter of time. With the way Broner went life and death with Emmanuel Taylor recently, it was a clear sign that Broner is not going far at 140. Khan would do a number on Broner if they were to fight at 140 or at 147. 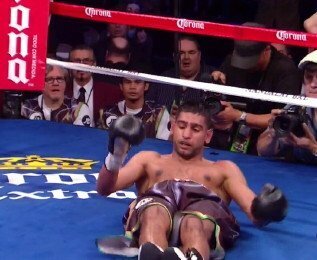 With the way Khan is fighting on his back foot now and doing a lot of grabbing to shut down his opponents, a guy like Broner would be totally lost against him.